Discovered 1745-46 by Philippe Loys de Chéseaux. Messier 71 (M71, NGC 6838) is a loose but beautiful globular cluster in the small but nice constellation Sagitta. 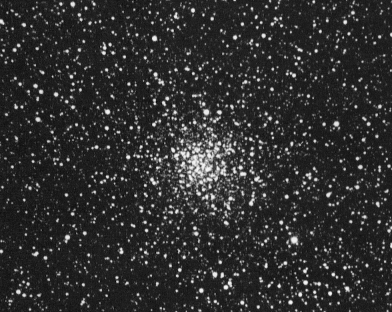 For a long time, the classification of M71 as a globular cluster was uncertain, many astronomers thought it was a rather condensed open cluster, similar to M11, e.g. Shapley, who classified it as type "g", his densest open cluster class, and Trumpler. James Cuffey of Kirkwood Observatory, University of Indiana, has investigated both cluster types. In 1943 he found that M71 was more resembling a loose globular like M68 (class X) or NGC 5053 (class XI), but in 1959 he took a Color-Magnitude Diagram which he found more similar to that of an open galactic cluster. Even Burnham is still uncertain of M71's type ! Also other criteria, as the radial velocity, and the abundance of heavier elements (metallicity) is of little help in this case: The radial velocity is poorly known, the sources differ from 80 km/sec in approach to 80 km/sec in recession, the most modern value being perhaps 23 km/sec in approach; this value is not very high and thus consistent with both types, and the metallicity is one of the highest for globulars, only M69 has higher abundances. It seems that the high metallicity is connected with a low number of RR Lyrae stars: None could be found in M71 (nor in M69), which has only 8 known variables at all. One of them is the irregular variable Z Sge (13.5..14.9 mag), one of at least six known M-type giants in this cluster. 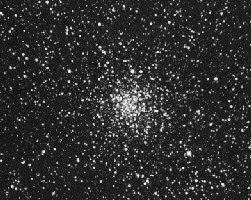 Nevertheless, there's now some consensus that M71 is a loose globular. According to newer sources (e.g., W.E. Harris' globular cluster data file), it is 13,000 light years distant. Its denser, easily visible core is only about 5 to 6 arc minutes, while in photos it has an angular diameter of about 7', corresponding to a linear extension of only 27 light years, small for a globular cluster. However, faint members have been detected out to a total diameter of 24', making it measure 90 light years. The membership of these faint stars, however, is not yet finally confirmed, according to Kenneth Glyn Jones. M71 was first seen by De Chéseaux, who cataloged it as his No. 13. It was later rediscovered by Johann Gottfried Koehler, between 1772 and 1779, and by Pierre Méchain on June 28, 1780. Charles Messier cataloged it as his object No. 71, based on his observations of October 4, 1780, as a nebula without stars. It was first resolved into stars by William Herschel in 1783. This globular cluster is easy to find and nicely observable even in good binoculars, by locating the 6th-mag star 9 Sagittae half-way between Gamma and Delta of that constellation. Medium-sized amateur telescopes are required to resolve this compressed mass of stars, but then even the center is resolved. The cluster is brighter and sharply terminated on the western side, forming a "curving V", as John Mallas describes it. Kenneth Glyn Jones and Vehrenberg mention that nearby, about half a degree to the SSW, large but faint and sparse open cluster H20 (Harvard 20) is situated, which is fairly difficult to recognize. This cluster contains about 30 stars scattered over a field of 7.8' diameter and is about magnitude 9.6.